This week the wool market appeared to draw breathe after the sharp falls of the previous two weeks. It was the fine end that fared the best, and of note was the strong competition for sound wool with low mid-breaks. The higher A$ saw only a 1 cent fall in US $ terms, while the Eastern Market Indicator (EMI) ended the week down 6¢ to close at 1738¢. The Western Market Indicator (WMI) also eased marginally to register a 2¢ decline to 1819¢ – figure 1. 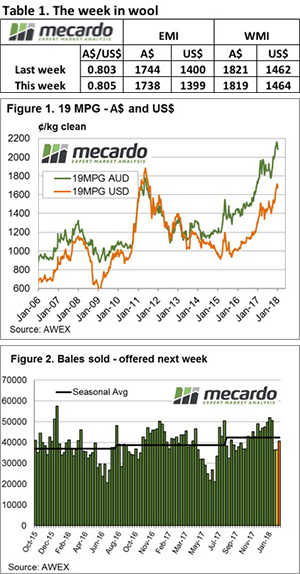 While the early sales for the week had buyers again showing caution causing the market to open weaker, by the end of the week a more positive tone had emerged. This was especially noted in the fine wool types (17MPG +21 in Sydney & +14 cents in Melbourne), as well as the mid micron categories. The 21 MPG in Melbourne improved 33 cents for the week while in Fremantle AWEX quoted the 21 MPG up 10 cents. Since the market peak in the first sale of this year, the EMI is down 4.4% although in US$ terms it is only 2.2% of the peak. The 17 MPG is in fact higher, up 1.4% %, while 19 MPG is 3.5% weaker. Cardings again were out of favour losing 30 – 40 cents, now having accumulated a drop over the last 3 weeks of 280 cents, a massive 21% down from the first January sale. Growers passed in 7.6% of the offering. 42,000 bales were rostered, however only 39,500 were offered with 36,584 bales sold. The past 2 weeks sales of 36,500 bales have been the lowest auction clearances since last September. A review of export destinations for the year to date reinforces the reliance the wool market has on China. 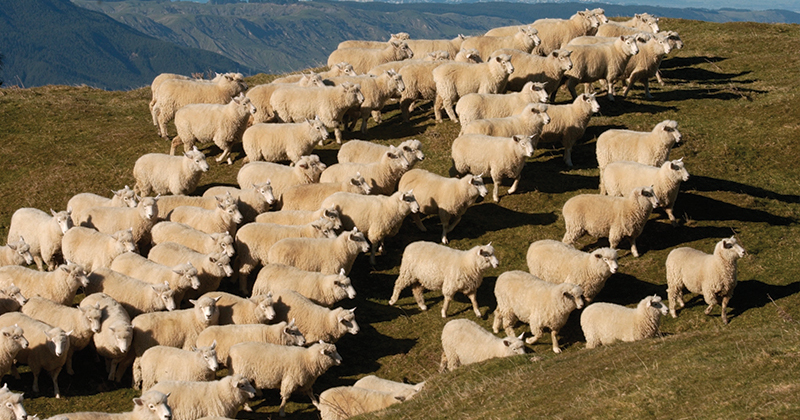 74% of all wool exported has been to China, with India taking 6% and Italy and the Czech Republic taking 5% each. The weaker market has seen the numbers cleared to the trade fall to the lowest weekly total since September last year, well below the season average of 42,300 per week. Sales are scheduled for Wednesday and Thursday next week in all three centres with a total of 40,000 bales on offer. Sydney has a dedicated Superfine sale.